Improving outcomes requires improved communication among practitioners. • According to NHANES, only about 60% of US adults 40 years or older with DME reported that they had received a dilated eye examination in the past year. • If ophthalmologists and diabetologists work together to ensure that timely DR prevention and treatment measures are implemented, this can help to optimize patients’ visual outcomes. • Routine communication between ophthalmologists and diabetic care providers is also important in maintaining the loop of continuous care. An EHR system can be helpful in this regard. Evidence suggests that the aforementioned guidelines are not always followed. This article describes some common features of electronic health record (EHR) systems that can be used on a daily basis to facilitate the eye care of patients with diabetes in collaboration with other health care providers. 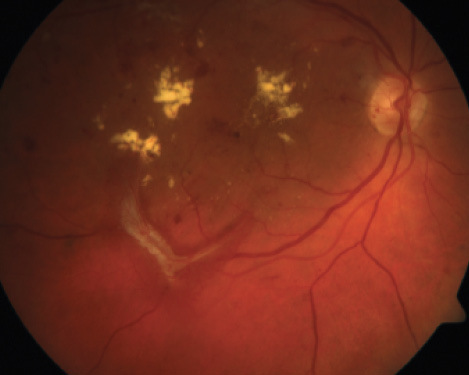 If ophthalmologists and diabetologists work in concert to ensure that timely DR prevention and treatment measures are implemented, this will help to optimize patients’ visual outcomes. There are a variety of tools available in EHR systems that can help to facilitate communication among specialists in the care of patients with diabetes. One of the features embedded within many EHR systems is a health maintenance tool (Figure 1). When activated, this tool adds reminders for completion of HbA1c tests, annual dilated retinal examinations, and annual diabetic foot checks. For example, when patients come to the Cleveland Clinic ophthalmology offices and receive technician-administered eye drops for pupillary dilation, the health maintenance field for dilated retinal examination is populated automatically. If a patient is seen outside of the Cleveland Clinic system, the diabetic care provider can manually populate this health maintenance field in the clinic’s EHR. This allows the Cleveland Clinic’s diabetologist to determine which patients have not met this metric so that letters can be sent to invite these patients to come in for DR screenings. Figure 1. The health maintenance feature of an EHR system can track reminders for patients’ tests and screenings and can be populated manually by other health care providers. Routine communication between the ophthalmologist and the diabetic provider is also important in maintaining the loop of continuous care. An EHR can be helpful by reducing the number of clicks and by providing relevant information to the diabetologist in a quick and efficient fashion. The communication manager in an EHR system can allow an ophthalmology provider to fax a letter directly from the EHR to a patient’s primary care physician’s office with an office visit note in just three clicks (Figure 2). This can make the primary provider aware of the latest ocular findings without him or her having to search through the record. Figure 2. An EHR system’s communication manager can be used to fax a letter with updated ocular findings to a patient’s primary care physician’s office. Figure 3. An EHR system can remind the eye care practitioner to send a letter to the patient’s referring provider at the end of the visit. Another tool that can help facilitate better communication among practitioners is a reminder to the ophthalmologist to send a communication to the referring provider (Figure 3). In some EHR systems, this reminder occurs at the closure of the patient encounter, when the EHR system detects a name placed in the referring provider field. If a letter has not been sent, this reminder tool provides the user with a pop-up alert that a consult letter should be generated for this encounter. Figure 4. 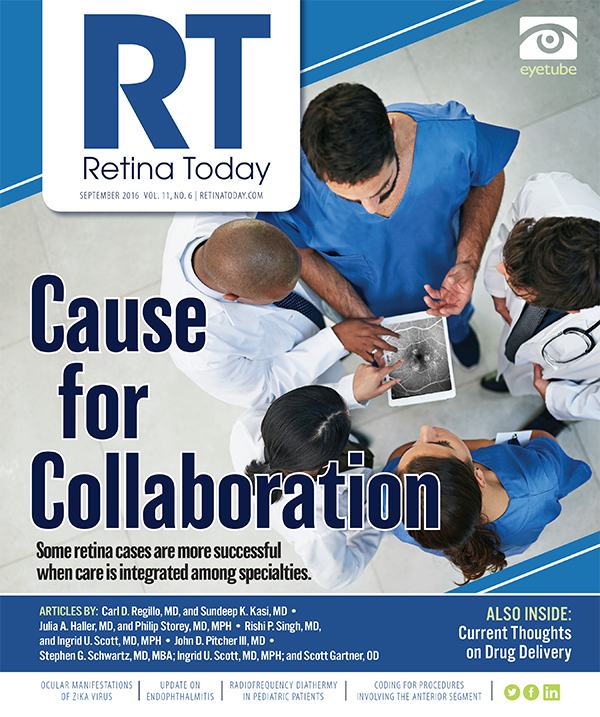 Using a central enterprise imaging platform available with most EHR systems, ophthalmologists can share a patient’s imaging photos with other physicians and with the patient. A feature that can enable ophthalmologists to better illustrate the level of DR and to share this information with other physicians is a central enterprise imaging platform. Use of this feature can allow all of a patient’s physicians to see the imaging that has been performed on the patient (Figure 4). All images from all clinical locations are stored in the central enterprise imaging platform, enabling the eye care provider to refer to these images when explaining to patients the reasons for their vision loss and the need for treatment. Patients can also have access to these images through a patient portal and can review them with their family members to promote better understanding of their disease. 1. American Diabetes Association. Standards of Medical Care in Diabetes – 2015. Diabetes Care. 2015;38 Suppl:S4. 2. Handelsman Y, Mechanick JI, Blonde L, et al; AACE Task Force for Developing Diabetes Comprehensive Care Plan. American Association of Clinical Endocrinologists medical guidelines for clinical practice for developing a diabetes mellitus comprehensive care plan. Endocr Pract. 2011;17 Suppl 2:1-53. 3. American Academy of Ophthalmology Retina Panel. Preferred Practice Pattern Guidelines. Diabetic Retinopathy. 2014. San Francisco, CA: American Academy of Ophthalmology. 4. American Optometric Association. Evidence-based clinical practice guideline: eye care of the patient with diabetes mellitus. St. Louis: American Optometric Association; 2014. 5. Bressler NM, Varma R, Doan QV, et al. Underuse of the health care system by persons with diabetes mellitus and diabetic macular edema in the United States. JAMA Ophthalmol. 2014;132:168-173. 6. Lee DJ, Kumar N, Feuer WJ, et al. Dilated eye examination screening guideline compliance among patients with diabetes without a diabetic retinopathy diagnosis: the role of geographic access. BMJ Open Diabetes Res Care. 2014;2(1):e000031. 7. Silva FQ, Singh RP. Evaluation and referral of diabetic eye disease in the endocrinology and primary care office settings. Paper presented at: Association for Research in Vision and Ophthalmology Annual Meeting; May 3-7, 2015, Denver. • Jack and Nancy Turner Professor and professor of ophthalmology and public health sciences at Penn State Eye Center, Penn State College of Medicine, Hershey, Pa.